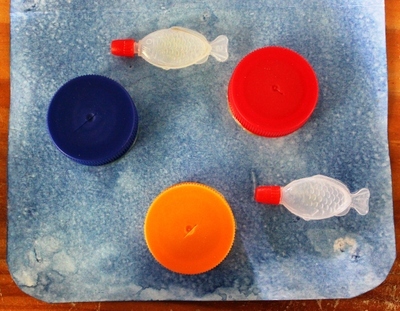 Here is a fun way to use some old (clean) milk bottle tops and turn them into a colorful underwater scene. We made this one for a friend's birthday card, however, this is just a basic guide - I'm sure you could get super creative with this one. Cut a piece of colored cardboard to the size you require (maybe for a birthday card). 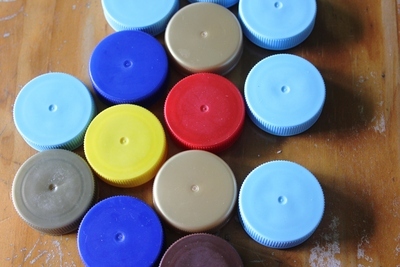 Save and clean some milk bottle tops and soy sauce "fish" (those cute little things that come with your take away sushi). Position the lids and "fish" on top of your cardboard. 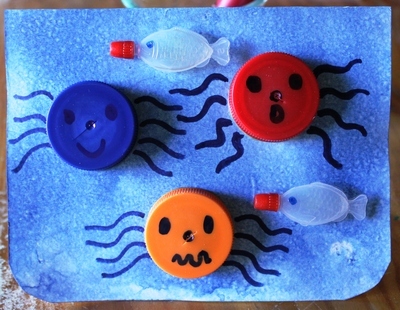 When you're satisfied with the design, glue each bottle top and "fish" onto the card board. When the glue is completely dry, add some eyes and octopus legs using textas. Decorate your background using crayons if you wish (does your underwater scene need some seaweed?). Now your card is ready to present to friend for their birthday. Have fun.